Hi, everyone! I hope you had a lovely holiday season! I know it’s tough resisting all the goodies this time of year (or tough dealing with the aftermath of eating said goodies, depending on what route you choose!). This is one of my favorite new things to make. 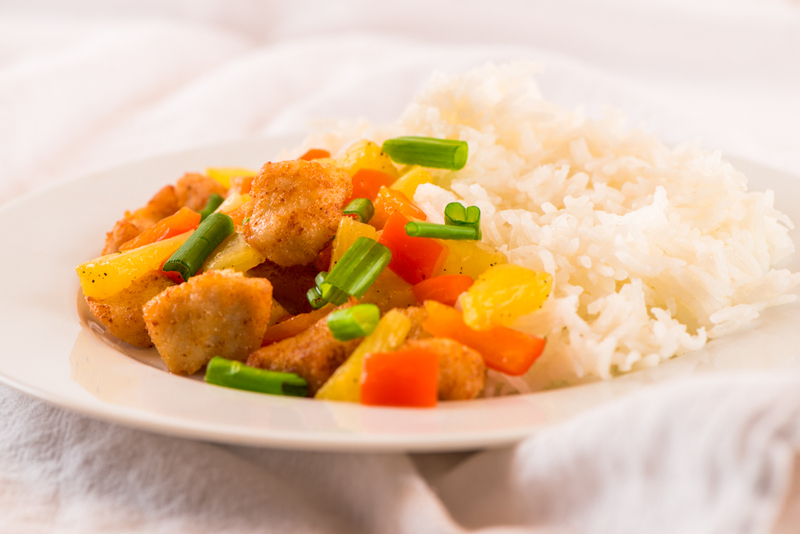 In my old life I never found sweet and sour chicken to be very enticing, but I thought this recipe from Paleo Leap looked so good I had to try it, with a few FM tweaks of course. (I also altered it so it’s the right amount for 2-3 people…if one of them eats a lot). Heat up the coconut oil or lard in a cast iron pot over medium-high heat (if you have a thermometer cook it at 350˚). Combine the rice flour, tapioca starch, salt, and pepper in a bowl. Melt butter (or whisk eggs) and dip the chicken in before coating it with the flour mixture. Cook the chicken until it is golden brown on all sides (cut a few of the larger pieces open to make sure they are cooked through). Set chicken aside. In a skillet, heat up some lard, coconut oil, or butter in a pan and add the diced bell pepper and the bulbs of the green onions (optional, can also just use for flavoring and discard after cooking). Cook for 2 minutes. While that’s cooking, mix together the pineapple juice, pineapple chunks, apple cider vinegar, chicken stock, dextrose/honey, and add more salt and pepper to taste. Then pour it into the pan with the peppers. Bring to a simmer and cook until the sauce thickens up a bit. Add the chicken back into the skillet and stir. 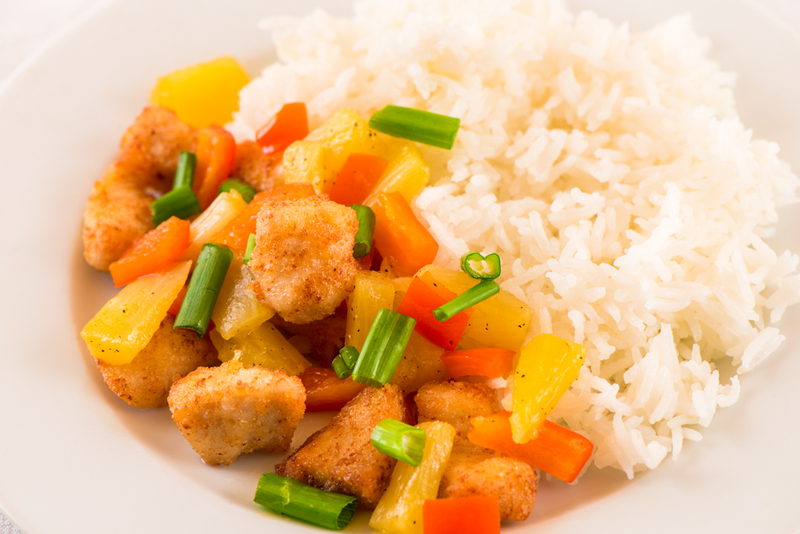 Cook for another 5 minutes and serve with white rice. This entry was posted in Recipes and tagged chicken, chicken stir fry, chicken stock, FODMAP, fried chicken, fructose malabsorption, low-FODMAP, Paleo by nosugarlessgum. Bookmark the permalink. Oh thank you for sharing! Yummy!! Thank you for your blog! This can be a isolating road…people do not understand. Want you to just eat “a little” of this or that food…..does anyone ever heal from this? Thanks for your feedback! I’m working on healing it right now. Hopefully in the next 6 months or so I will retake the breath test! You can retake the fructose breath test? Does that mean that you could potentially not have FM anymore?